Suitable for ages 5 to 8. Develops early number skills, counting, order relations, addition, patterns and problem solving. Free app with no requests to purchase anything further. Suitable for ages 6 to 8. Encourages several counting strategies. Can change settings of mode (normal/tool round/speed round) and level (normal/ easy/ medium/ hard). Free app but only available from Apple Store (on ipads). Suitable for ages 7 to 9. Encourages use of various addition and subtraction sums to equal one answer within 10. Can change settings within practice of skills and modes. Free app but only available from Apple Store (on ipads). Suitable for ages 6-8. Begins with counting but progresses to addition and subtraction within 10. Lots of levels with increasing challenges. Free app for these skills with in-app purchases available for older children. Suitable for ages 8-10. Begins with addition and subtraction within 20 and also an option to have mixed operations. Lots of levels with increasing challenges. Free app for these skills with in-app purchases available for older children. Suitable for ages 7 to 9. Games using penguins who race against each other and speed of movement depends on answering sums. Records accuracy and speed. Settings allows more challenging sums with use of numbers up to 20 and also allows negative number answers. All four operations of Addition, Subtraction, Multiplication and Division available. Free app with no adds or in app purchases. Suitable for ages 6-9. Grade 1 develops concepts of greater than or less than, number sentences, and subtraction. Grade2 develops number patterns, place value, and greater, less or equal to. 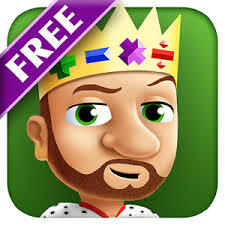 Free app with in-app purchases available. Suitable for ages 6-9. Encourages practice of addition/subtraction within 10, 20, 100. Timed for one, two or five minutes with leaderboard recording scores. Free app available on Ipads. Suitable for ages 6 to 9. Two settings:Reading o'clock time on analogue clock and recording it in digital format; and Reading time in five minute intervals. Free app with two more modes of difficulty with in-app purchase. Suitable for ages 6 to 8. Covers number concepts of place value, ordering numbers, largest numbers, number patterns, number bonds, number comparison (<=>), even and odd, number line, analogue clocks, time conversion (hours/minutes/seconds), hundred chat, add/subtract with blocks, ten grid and number grid. Free app with lots of material.